Updated: March 15, 2018, 7:15 p.m.
Katie Allen already knows what she wants to be when she grows up: a writer. “I’ve already been thinking about a plan,” she said. That plan includes her dream of living in California and studying how to write novels. 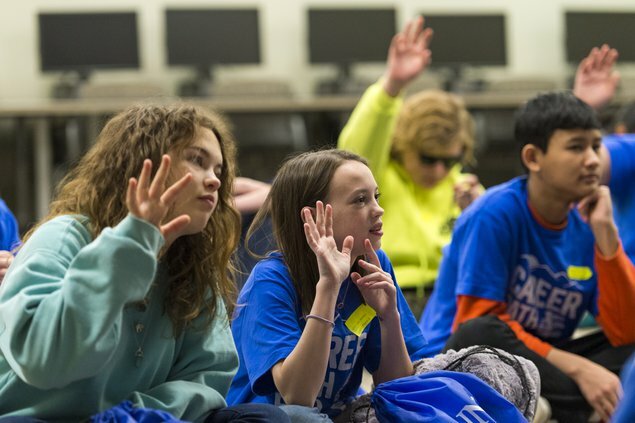 For many of the 500 seventh-grade students that attended a career fair at the University of North Georgia’s Gainesville campus on Thursday, March 15, dreams for the future feel set in stone. Ryan Lynch, for example, is dead-set on attending the University of Georgia and studying sports journalism. And even Lynch admitted that the career fair was a good opportunity to explore what else the world might have to offer when he becomes an adult. “I thought (the career fair) was going to be cool because you get to learn about jobs you might not think about,” he said. More than 50 local employers were on hand to show students just what else is out there when it comes to a career, including landscaping and manufacturing companies, financial institutions, tourism agencies and public servants like the Gainesville Police Department and Hall County Fire Services. The career fair was developed as a collaboration between the Greater Hall Chamber of Commerce, the Vision 2030 Education Consortium, UNG, and the Gainesville and Hall County school systems. The chamber has worked with high school students in recent years to get them involved in work-based learning programs, particularly in the local manufacturing industry. And before entering high school, local eighth-graders choose career paths to explore. But connecting with students at an even younger age is critical, said Shelley Davis, vice president of existing industry with the chamber. For student Emma Carter, the career fair was an opportunity to do one of her favorite things. Carter said she wants to study music education one day. And for Kayley Williams, the future is something she looks forward to. “I want to be a doctor,” she said. Even while many students may have an idea of what career they want to pursue down the road, important lessons were on display from a host of employers. “I think those are pretty good principles no matter what your career path,” he added. Davis said she hopes the career fair can be expanded next year to include more students, employers and local education partners. “We just want to make sure that what we’re doing is the most effective for the students and the schools and the employers,” she added.